The Morris Major and Austin Lancer are passenger car models produced by the British Motor Corporation of Australia (BMC) between 1958 and 1964. The Morris Major name had been used before by Morris Motors in England, first appearing between 1931 and 1933. The Major and Lancer evolved though three series (I, II and Elite,) with the first incarnations being badge engineered clones of the contemporary Wolseley 1500 and Riley One-Point-Five models then on sale in the United Kingdom. 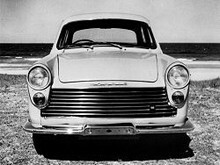 The Austin Lancer was phased-out of production by April 1962. These models were wholly produced at BMC's Zetland plant in Sydney, Australia and were unique to that country, having around 98% local content. Many examples were also exported to New Zealand.